Once there lived a butcher who always chanted the name of Srihari Vishnu. Even while cutting meat he used to chant the name of Srihari Vishnu. The story of Shaligram and butcher symbolically teach us that what is important devotion and not rituals. The story also teaches us about the importance of the chanting of the name of Vishnu in this Kali Yuga. The butcher once accidently hit his leg on a stone. He picked up the stone to keep it away from the walking path. But the butcher was attracted by the unique shape of the stone and thought he could use it to weigh meat in his shop. He took the stone with him and started chanting the name of Srihari Vishnu. The stone had miraculous powers. It weighed the exact amount of meat the customer asked. If the customer wanted a kg of meat, it weighted a kg exactly. If another customer wanted 2 kg, it weighed 2 kg. Soon, the news about the miraculous weighting stone spread to the nearby villages and towns. A devotee of Vishnu happened to hear about the stone and wanted to see it. When he reached the shop, he realized that the stone was not an ordinary stone but a Shaligram – holy stone associated with Bhagavan Vishnu. The man immediately told the butcher that the stone was a holy one and it should not be kept in a meat shop. The butcher realized his mistake and asked the man to take the holy stone and do the necessary puja as he did not know how to perform pujas and rituals. The devotee took the Shaligram to his home and performed the necessary puja. But on the very first night the man had a dream. In the dream, Vishnu asked the Shaligram to be returned to the butcher. Vishnu told the man that He was pleased with the puja and rituals but was happier to be with the butcher who always chanted His name. The butcher always remembered Him. He did his work as an offering to Him. Therefore, Vishnu wanted to be with the butcher. The man returned the Shaligram to the butcher and narrated what had happened. A happy butcher took the Shaligram and started using it as a weighing stone. 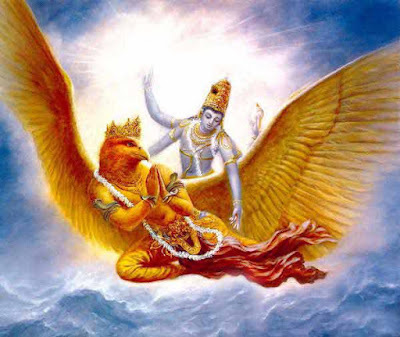 He continued chanting the name of Vishnu. The Vishnu devotee too started concentrating more on charity, devotion and chanting prayers.